The web pages which follow provide step-by-step instructions for building a deck on a 2v optimal dome. 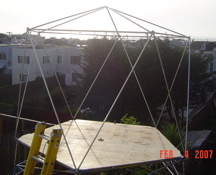 In fact, you could build a deck on any geodesic dome. It took me about eight hours of labor to construct the parts, except that I already had some pieces left over from previous projects. I'd say this is a good weekend project. If you are also planning to construct the dome on which the deck will rest, build the dome first. It makes no sense to begin the deck project until you have the dome finished and assembled. The most common question I receive is: How much weight will the dome deck support? If your dome is a 2v optimal dome built with 3/4" conduit, your dome deck will safely support 600lbs if it is distributed around the deck. I tested my deck with 815lbs and it did not fail. However, I still recommend that you post signs saying there is a limit of 600 lbs, because it provides a margin for safety. If you use 1" conduit for the five top struts in the dome (the pentagon at the top) you will increase the strength of the dome, reducing the chances of failure; however, even with that I would still place signs saying the weight limit is 750 lbs. The weight must be distrubted around the deck! The weight limit at any given point is probably no more than 250 lbs, so the deck will fail if four people stand over one vertex or in the center. You'll need to stake your dome down with at least 5 pieces of 2' rebar (1/2" thick), pounded in 18". Put them at every other vertex around the base, at a 60 degree angle to the ground. They should be inside the dome and cross the vertex, so that the tennis ball is outside the dome. The rebar should be in contact with the vertex. Cover the ends with a tennis ball that has had a hole cut in it. The hole should be slightly smaller than the diameter of the rebar. You can get them out with a vise-grips by using a twisting motion as you pull them out. Here is a list of materials you'll need. 36" of angle iron, 1.25" x 1/8"
about a 4' length of 2x4 for a coplaner jig, unless you already have one. about a 4' length of 2x4 for a conduit drilling jig, unless you already have one. about an 8' length of 1x2 for a conduit drilling jig, unless you already have one.